6 am and back in the car headed for Yirga Cheffe town guided by Mike from Moplaco, who is bravely facing the 9 hour drive south into the Sidamo region. Drive for 9 hours in Ethiopia and you sure get to see some stark contrasts. 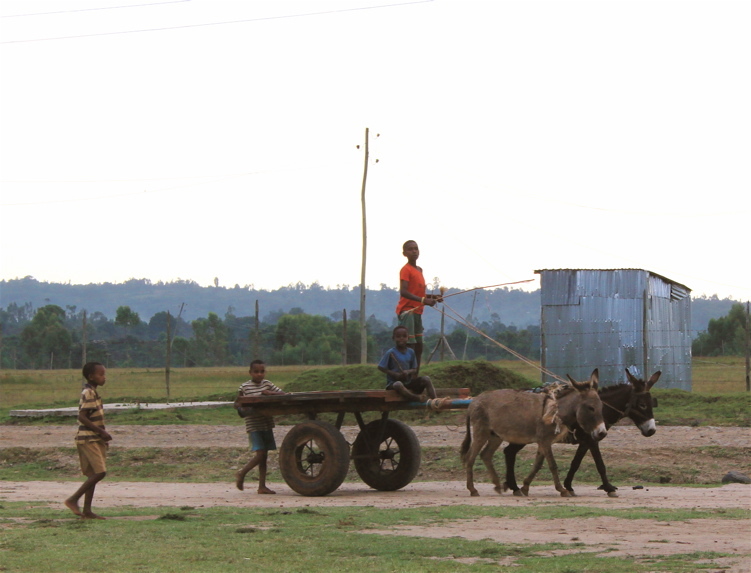 You pull out onto the road in Addis and in between the lorries the motorcycles and the Tuk Tuks you also get flocks of goats and cattle being herded through the roundabouts, and horses and donkeys pulling carts piled high with wares headed to market. One of the first sights leaving Addis is the Eastern Industrial Zone. As part of their free trade agreement an enormous compound has been given to the Chinese by the Ethiopian government so they can build 122 factories and housing for employees. While disastrous for local factories, it would also create thousands of new jobs, and the impact this all has on the local economy is profound. Slightly further south, a Chinese owned cement factory recently spewed out enough polluting fumes to close down the local, rather large poultry farm, causing the cost of an egg in Addis to go from 0.8 birr to 2.5 birr. 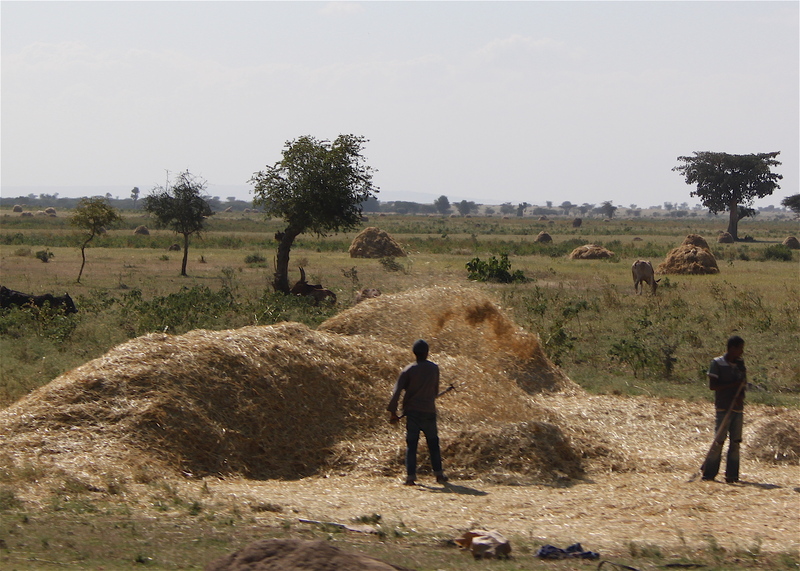 Side by side with these factories, people are scattered in fields, hunched over in the sun cutting the injera base-grain tef with large knives, gathering the harvest by hand and piling it up to dry. A constant stream of people walking, walking, walking, toddlers playing on the roadside and animals wandering all over grazing on whatever they find. The traffic on roads both big and small is busy and chaotic, but even with passing two severe car accidents, some wild pig road kill and seeing some goats knocked over by a truck (they were ok in the end! ), I still was happier in the car than I was being told my plane was having ‘mechanical problems’. Mike did some great driving and the landscape is just so fascinating to watch, I never tire of it. Just around Debre Zeyit town and it’s seven surrounding volcanic lakes, we hit the famous Rift Valley. At Mojo we took the exit south towards Shashemene, and passing Lake K’ok’a an interesting discussion about how the growth in the flower farming industry might be influencing coffee came up. 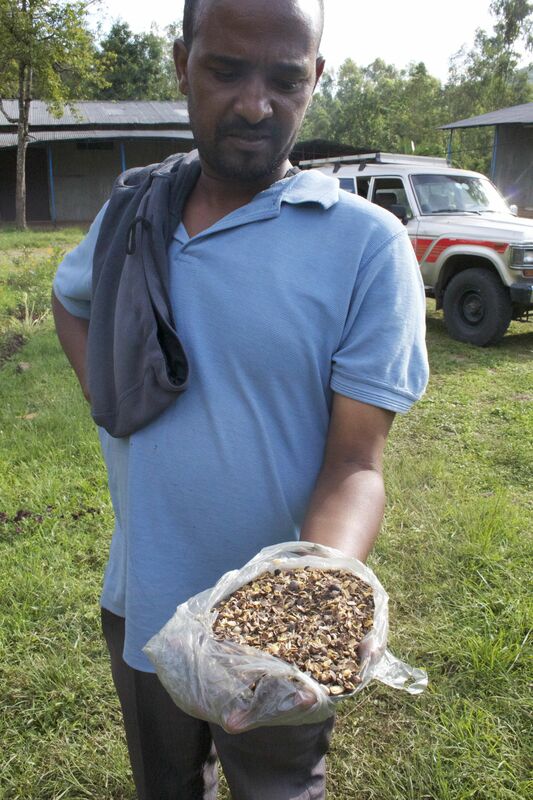 Recently more and more Ethiopian coffee has been showing traces of chemicals in them, in spite of the fact that farms here can’t afford to use chemicals to fertilize or control pests and are by default organic. One of the causes could be that rose farms like the ones near Lake K’ok’a do use chemicals (a lot, you can almost smell it in the air) and that these wash out into the rivers leading off the lake into coffee growing regions. Another possible cause could be that as the health authorities spray houses for Malaria, any coffee which might be drying or in storage inside the houses also get sprayed and thus get flagged when we test for contaminates. Passing through Ziway we decided to pull off the road at Lake Langamo for a quick coffee and some breakfast, much needed as the early start and 34 degrees C at 9:30 am was starting to cause a bit a drowsiness at least on my part. Refuelled it was onwards through the cute little town of Negele where I suddenly noticed what was to become a common sight as we went on: lots of roadside pingpong and foosball tables – I kinda wanted to pull over for a game but we had to rush on! At about 2000 masl the landscape started becoming a lot more green and lush, such a contrast to dry, dusty Harar, and the vegetation changed in, well, many ways. Hitting Shashemene Mike explained that this was the spiritual home of Rastafarians in Ethiopia- emperor Haile Selassie was a holy person for Rastafarians in Jamaica and so many made the pilgrimage to the emperors palace in this little town. Many were given land and settled, and in between their rasta history museum and pictures of Bob Marley you could certainly smell the distinct aroma of another rastafarian influence. Seems that if you feel like indulging in something other than chat, Shashemene is the place to go! Kids will freely come up and offer you ‘medicine’ in code names like ‘marlboro’ or ‘marlboro light’ – depending on your level of… expertise. We briefly paused just outside Awasa, the capital of Sidamo, to have a cup of coffee with Phil and Ed from Schluter who just so happened to be accompanied by Mr. Haileselassie Ambaye, the man behind our Kebado Dara! He’s been in coffee for close to 20 years, in the local market selling coffee to the akrabis (the owners of the washing stations, here in Yirgacheffe also called suppliers), as an akrabi himself, and for the last 6 years also working as an exporter. He now has 18 people working in his office, is building a new dry mill and is investing in new trucks for transport, so I’m looking forward to seeing where he goes from here. Heading out of Awasa, the road led through a mountain pass that marked the beginning of Southern Ethiopia and our destination; the coffee lands of Sidamo. With the changes in global climate conditions, rains came late this year and at unfortunate times, so while the washing stations here are normally in full swing in November, this year they’re either completely quiet or just starting on the first pickings. 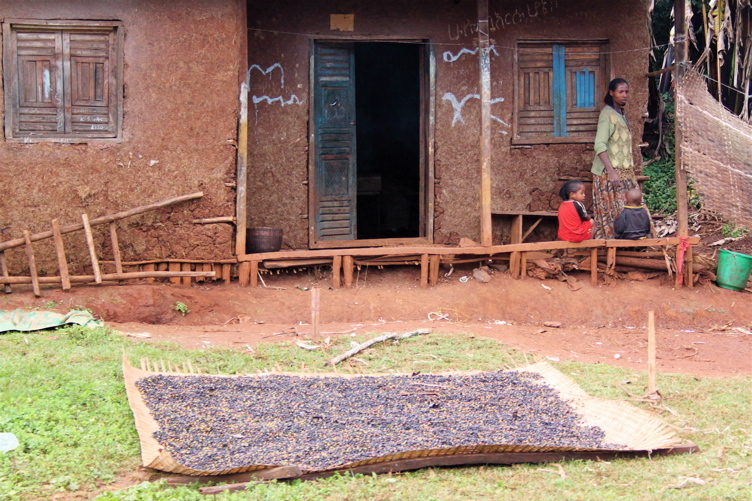 The rains that came late essentially knocked a large portion of the flowers off the trees, cutting cherry development in Sidamo by around 20% of expected levels. Around Yirga Cheffe specifically they might do a bit better, but it’s just another hurdle that the growers here don’t need. 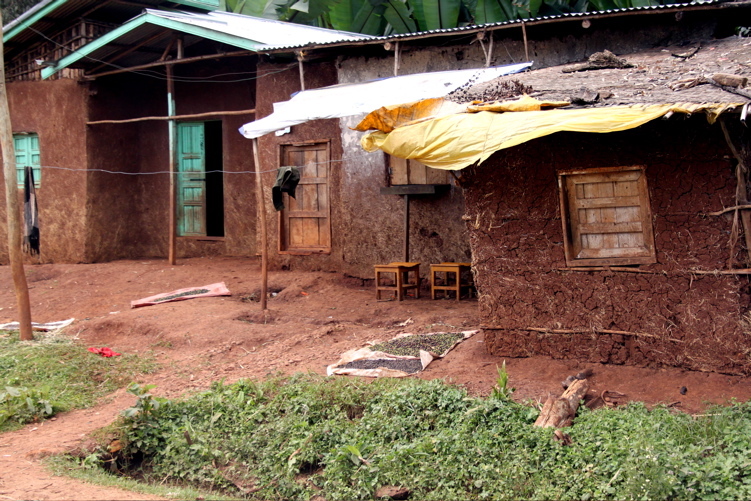 Many are turning to growing chat for chewing or eucalyptus trees to produce trunks for the construction of houses, which depletes the soil of nutrients that the coffee trees sorely need, further complicating the matter. In order to help the situation, the Ministry of Agriculture have for the last 5 years been encouraging people in Yirga Cheffe to plant more trees, especially of natural, local hybrids like Curume but also Dega, Woolisho and ones developed by the University Research Centre in Djimmah: 74158, 74114 and 74110. 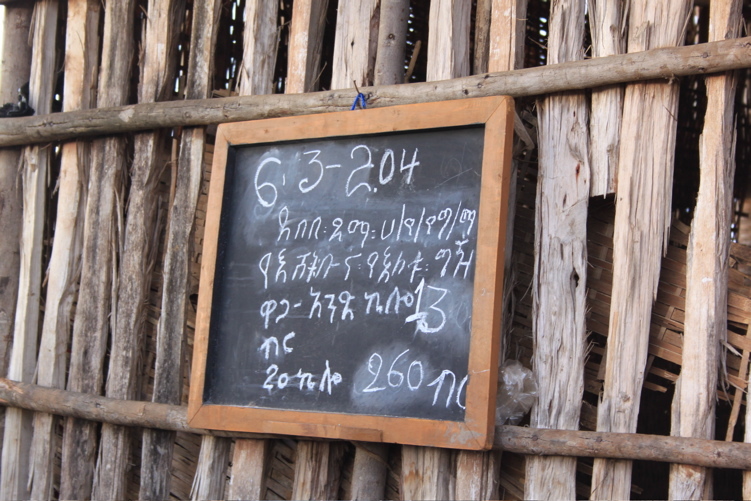 Not the most romantic names but they were developed to suit this Gedeo tribe area specifically and give higher yields. A fairly reasonable price of 10 birrs will buy you 6-7 coffee plants, but only time will tell if this will help turn the trend. As we slowly climbed higher into Sidamo, we started seeing a lot of small garden farms along the road, and reaching Yirga Alem (I’m told it means something like ‘settled/restful world’ while Yirga Cheffe means ‘settled/restful wet grass/marsh) discussion turned to how these tiny producers get their coffee sold. 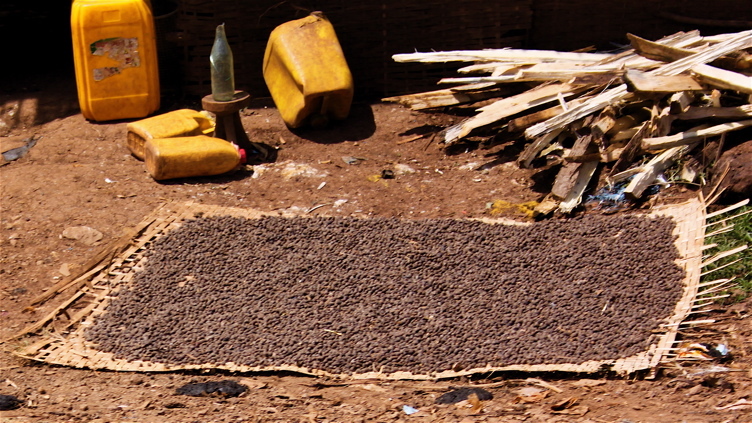 In a system slightly different to Harar, the coffees here are often collected by people called brokers, who are either sent out by akrabis to collect certain coffee or who collect their own selection and sell the cherries on to the akrabis. Growers can sell direct to the washing station, but where they don’t you’ll see the brokers going from house to house with a collection bag and a measuring bowl for the cherries. 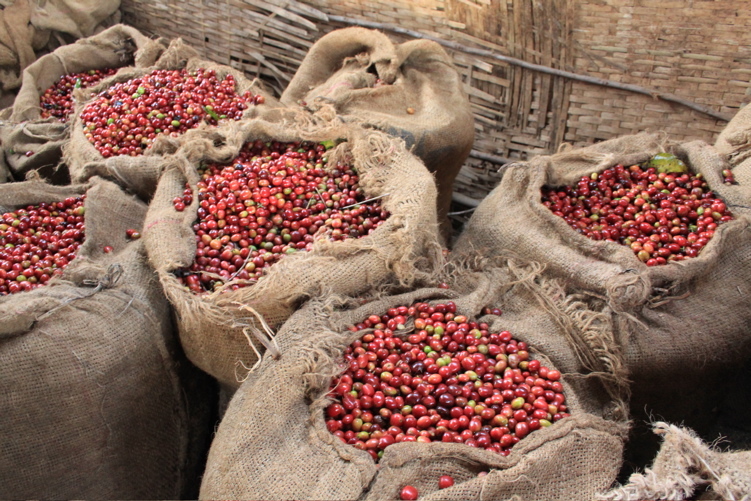 Currently the internal market is very high, and 1kg of red cherry would collect about 13-16 birr in Yirgacheffe. You’d need about 6 kgs of cherry to make 1 kg of green coffee. The price that these growers get is not governed by the ECX, so it is up to the brokers and washing stations to set this price. However, the EXC controls how much the washing stations get for their coffee, so if the margins become too tight there- problems will ensue. The concern is that this would return the full control of how much growers are paid back to the government- not a desirable prospect for many. Just outside of Dila we briefly left Sidamo and drove through a tiny sliver of Oromian land, signified by two control posts about a 3 minute drive apart. 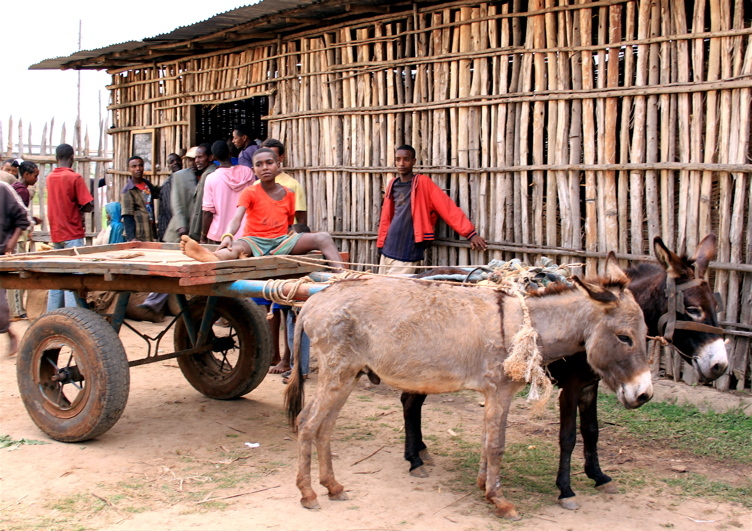 Oromia and their tribe is the largest grouping in Ethiopia, and there is movement towards their wanting a possible separation from the rest of the country. 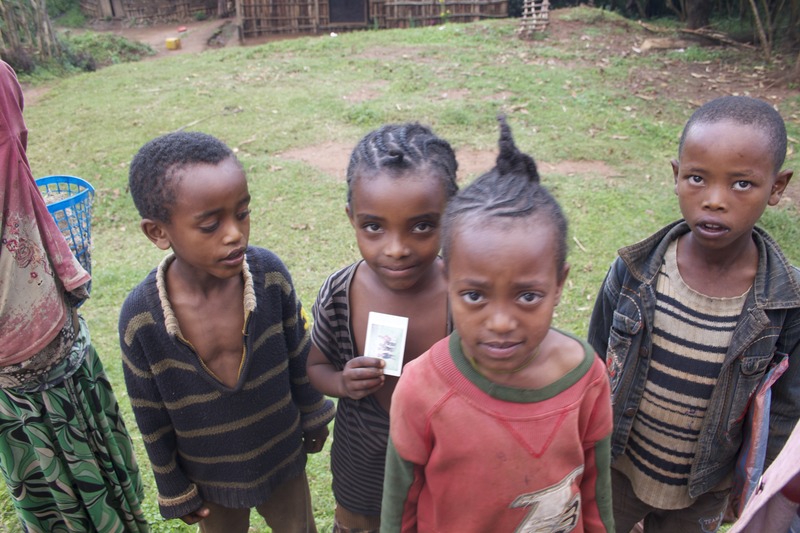 While the smaller Amharic tribe speak the official language of the country, in Oromia many schools have now stopped teaching Amharic to the children, further deepening the divide between the two tribal cultures. In Dilla, the capital of Yirga Cheffe Gedeo area, we passed by the warehouse where the EXC store their Yirga Cheffe coffees (the Sidamos are kept in the Awasa warehouse where we’ll go on Thursday) Along the roadside piles of waste pulp from local washing stations started appearing, brought there as free fertilizer for the farmers. These piles quickly become a bit funky, so I was grateful to also start smelling lovely wafts of coffee roasting from many of the houses. Finally, after 9 hours and 15 minutes we arrived in Yirga Cheffe. At the Moplaco warehouse in Adame I picked up a bag of parchment so I can try making Hoja, I have no great hopes that it’ll be very tasty but at least it’ll be an experience! More details on how the ECX works when it comes to dealing with washed coffees as opposed to sun dried had to be clarified, so a round of questions were thrown at the very patient Mike. From what I gather, the suppliers once in possession of the red cherries will pulp them, soak them for the neccessary time to ferment the pulp off, then rinse, maybe re-soak, and spread the pergamino out to dry. Drying takes an average of about 7 days, and at the correct export level of humidity and ready to sell to the ECX it is bagged into 60 kg bags, still in pergamino. 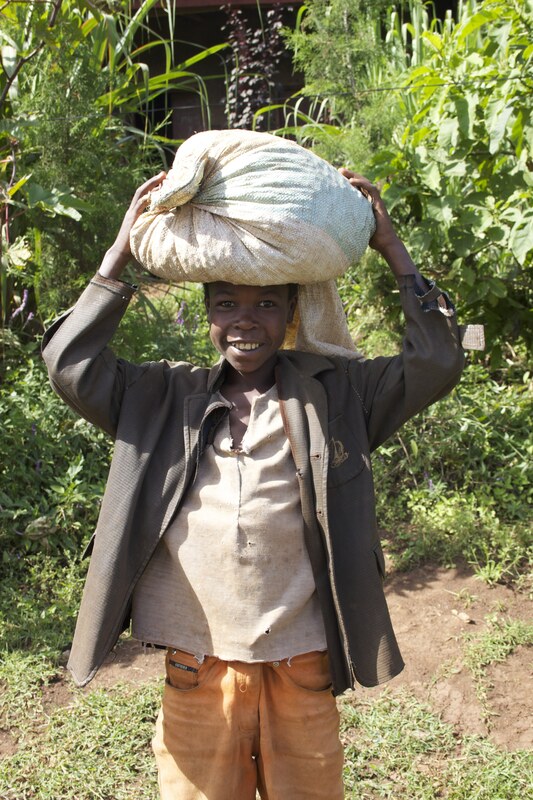 Like in Harar, the lot size that will go to the ECX has to be 30 of these bags. 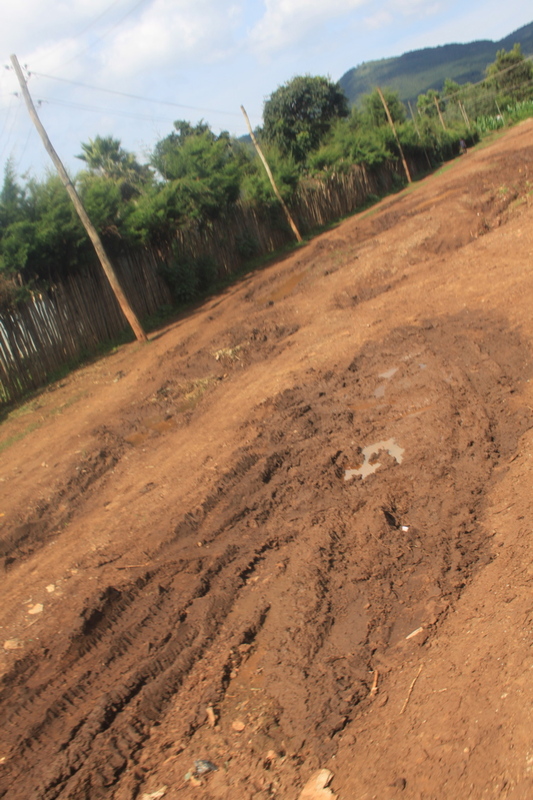 A washing station that qualifies to be a co-op (min.18 members and 30 hectares of land) can sell direct to an international buyer but to sell to an Ethiopian exporter they have to go via the ECX. We also ran into Mr. Ferenju Defar, one of the most successful coffee producers in Yirga Cheffe and owner of 5 washing stations. 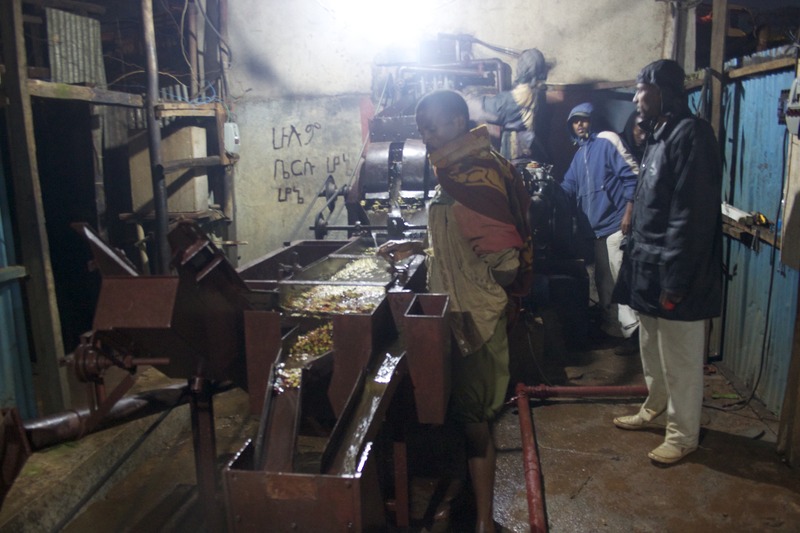 He fills about 17 trucks of coffee in a season, and makes about 270 000 birr on each of them. He has been speculating a bit and was worried about losing money this year, as prices have been unstable. Six months ago, and still today, internal prices for coffee are high, in part due to the high demand and the late harvest. Many also wish to pay good money so they can ensure a steady supply from growers and brokers, and pay their staff well so that they will be loyal and form an efficient, solid crew. The akrabis pay good money thinking they’ll sell it on at a higher price still, but the (unrelated) prices at the exchange (who base their prices on where NY is at and what the previous day’s closing prices were like) and the international market have dropped, and many akrabis are facing a situation where they might have to sell their coffees for less than what they paid for it. A day in the coffee harvesting season here usually runs something like this: cherries are picked in the morning to early afternoon, brokers collect them in the late afternoon, deliveries to the washing stations take place just before dark and pulping happens at night. As the crop is late, what we saw was the very early pickings in such small quantities that many growers instead of selling fresh cherry off to be washed, were sun drying the coffee themselves on mats in their front yards. They get a better price for the dried cherry as there is added value in some of the processing work already being done, but it’s also a risk for the brokers to buy these as the quality of the cherry is much harder to determine. 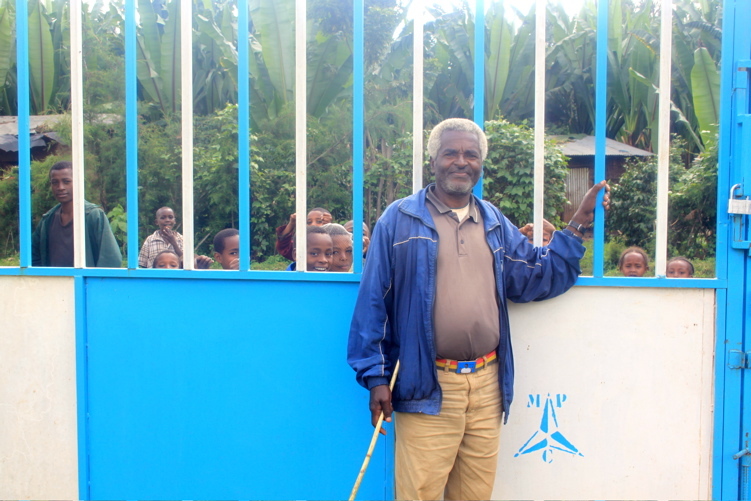 It felt like time to see one of these washing stations in action, and although early in the harvest we found that one of the Yirga Cheffe stations belonging to Alemau Birhano had started processing. 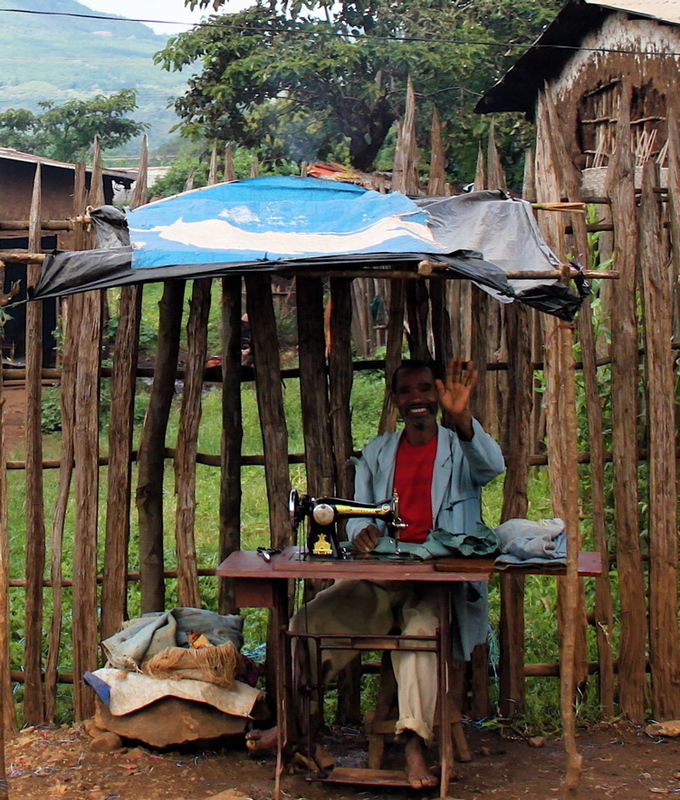 He has six stations, some of them also in Sidamo. We arrived at dusk, just in time to find a team of ladies finishing the hand picking of parchment on the drying tables, sorting out the damaged, crushed and pinched beans caused by a pulper adjusted to a ‘less than ideal’ medium setting for an early harvest consisting of great variation in bean size. Singing as they worked, it was quite the sight (video to come!). They expect to do about 30 trucks of 120-150 bags each out of this station in the coming harvest. As the sun set, we returned to the hotel for dinner and to wait for 9pm when we would head back and watch the pulping of the morning’s harvest. Alemayu Birhano is different from many washing stations in that it uses underground water pumped up from a well to wash the coffee, rather than water from the river. We watched as the bags of cherry from one broker was lifted off the lorry to be weighed and loaded into the holding tank. From there the cherries passed through a pulper, got floated and separated into Grades 1, 2 and 3, and channeled off into three separate fermentation tanks. There they will stay for about 36 hours before being channeled on and rinsed clean of the pulpy remnants, before going into another tank for a final 16 hour rinse. In the darkness with the fog and two or three lamp posts casting a golden haze over the scene, I have to say it was quite magical to watch the crew work, to smell the pulp and hear them shouting instructions over the noise from the machines and rushing of water. Cameras never do this sort of thing justice and certainly not when placed in my hands, but I tried to capture some of the scenes and will add more images soon! 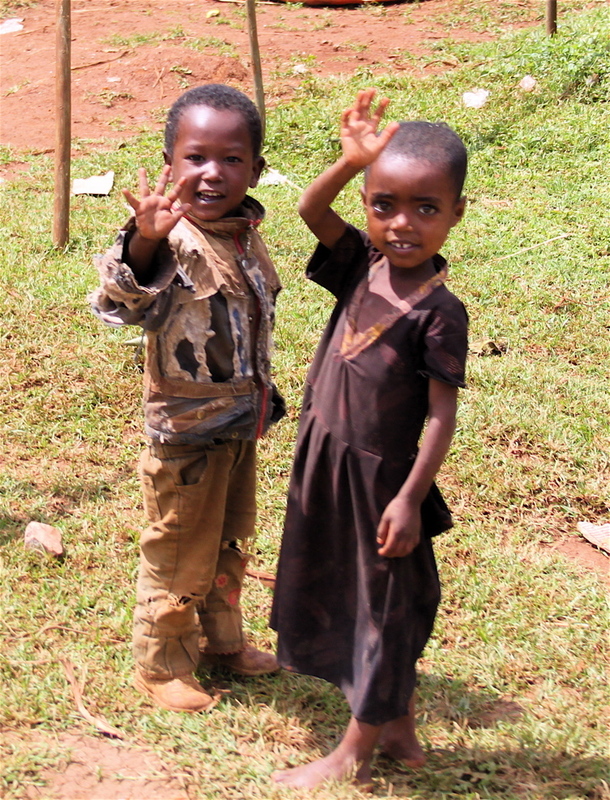 Tomorrow we drive to Sidamo. I can barely cope with all the impressions from today so I’m bracing myself and charging every battery I have for some serious documentation. Other than that, I fed a hungry kitten today and took some polaroids of cute kids, and the starry night sky here is blowing my mind. Between the disco ending at 1 am and the chanting from the churches starting at 5am, sleep at Lesiwoth – the only hotel in Yirga Cheffe – proved a challenge for this light sleeper. But as they’re currently building the town’s second hotel just down the road, next time I’m here perhaps I’ll have more luck! 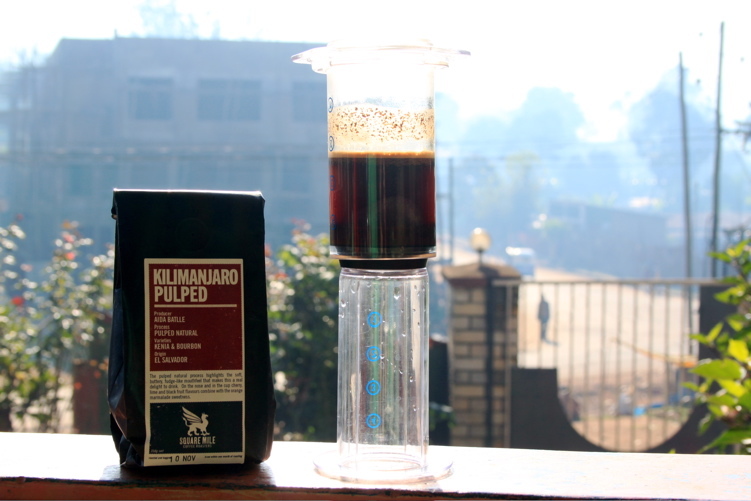 Nevertheless, starting the morning with an aeropress of Kilimanjaro Pulped cures all gruff! Sitting on the next table over and watching the brewing process with some amusement happened to be Mr. Dakola, another local akrabi who owns several washing stations through Yirga Cheffe and Sidamo. He and his colleague Emnete had a taste of my brew and noted that the coffee had a distinct wine quality to it, so we had a nice chat about varietals and soils and their influence on cup quality. However the conversation again turned to the ECX. They asked me if I knew why the EXC sometimes go through the whole grading and cupping selection twice for one lot, apparently often resulting in a downgrading of their initial findings. I did not know anything about this but I’m curious if I can find out if this is true and if it is; the reasoning behind it. The Ministry of Agriculture has been known to openly acknowledge that they have no interest in specialty coffee as it’s such a small part of the total coffee trade, while simultaneously keeping certain doors open for the marketing and export of it. Still, the more people I speak to the clearer it is that there is a feeling amongst some suppliers that they are actively being discouraged from producing specialty, and not always without underhanded methods. I look forward to finding out more sides to the story when I actually see the EXC in action and get to speak to some representatives later on this week. It became time to set off towards Kochere and the lovely little town of Chelelektu. The nearby river Abays recently flooded here and the roads were impressively chewed up because of it, but we made it to a mill where Tesfaye the groundsman and manager Malesa gave us a a quick little tour. Next to the mill is a small coffee plantation where we were able to see another challenge posed by changes in the climate; the trees were being hit by coffee berry disease and turning black on the branch. 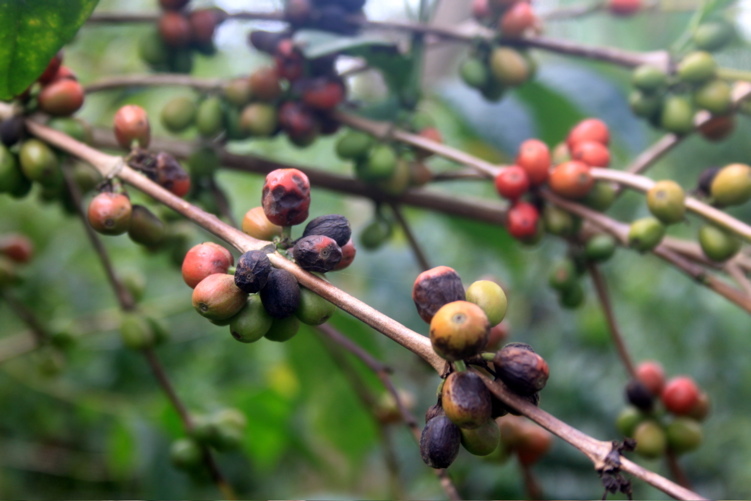 I also learned that the cutoff point where garden coffee is considered more as plantation coffee is around 10 hectares, still with some consideration for whether the production of cherry is more haphazard or purposeful. Just nearby we found two lovely ladies drying cherry on beds, and while the little girl at first started crying at the sight of us, she was brave enough to have her picture taken once her mother came to the rescue! 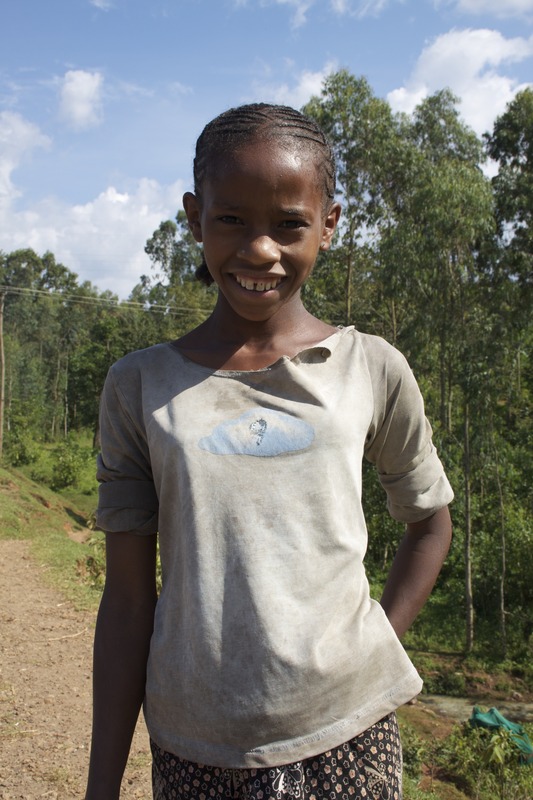 For the most part kids run after us smiling waiving and shouting ‘youyouyou’ and ‘ferenj’ (white person), while grown ups look at us with some bemusement when we stop the car to take pictures of trees, goats, signs – anything really, so tears from the little girl was a bit worrying! I’m traveling with a polaroid and try to give a print back to those who kindly pose for me, so I hope the one I took of them and handed over as a thank-you at least made her think we weren’t all that scary after all. Back north through Fishagenet and Konga, passing rivers where trucks, tuktuks and motorcycles were parked along the bank and given their wash and shine, past hillsides dotted with washing stations, we eventually hit Yirgalem and its Ministry of Agriculture offices. A representative joined us for a trip to see where the coffee collected by farmers and brokers is brought to the akrabis for sale. 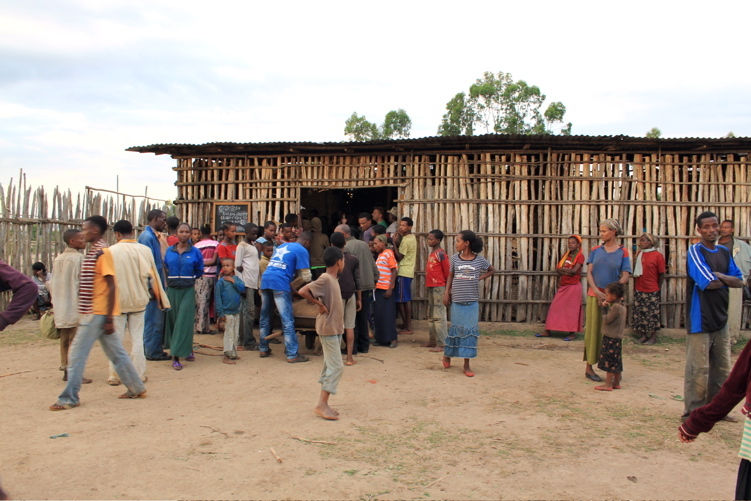 There are 51 washing stations in this part of Yirgalem (17 of them co-ops). At one buying station several akrabis have their own rooms where blackboards by the door announce the name of the buying mill and the date and the price they’d currently be paying. One of the washing stations owned by akrabi Mr Debebe Dema was paying 13 birrs per kg and seemed to be doing brisk business; Asafa Waranga who was in charge of buying this afternoon estimated that between 12am and 6pm in a good day he could buy around 10 000 kg cherry from about 560 people. Payment to the sellers isn’t immediate; they all get receipts that they’ll have to bring back in a few days to cash in. A few doors down the co-op of Goyda was also buying cherry and I was surprised to learn that they can actually buy from non-members too – but only the members get a share of the profits made. When this happens it obviously further clouds the traceability aspect for international buyers who like to know the specifics of who they’re buying from, but the more I’m learning about how Ethiopia works the more I realize that the complicated grids and layers of their systems are perhaps impossible to ever fully control, or in all honesty, ever fully trust. Having cleared it with Asafa, we decided to pay a brief visit to Debebe Dema’s station. 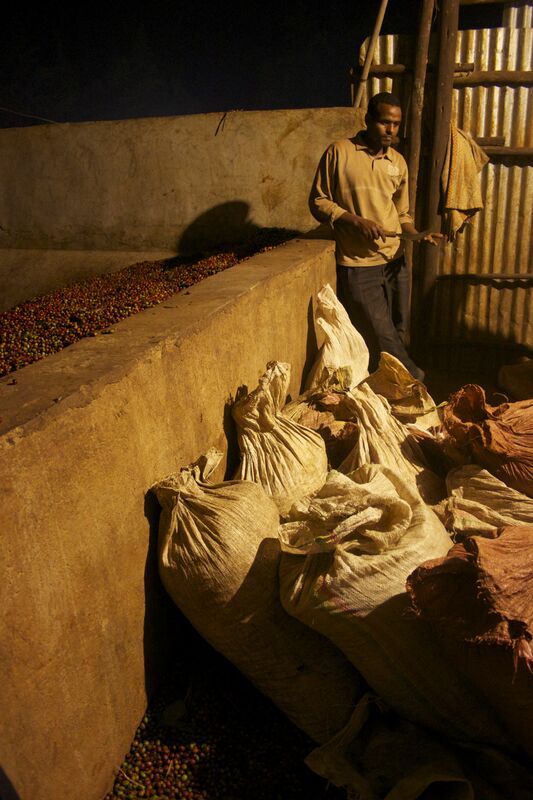 Luckily he was there and could show us his drying tables and warehouse and he agreed to let us return later in the evening around 9pm to see the pulping process in full swing. A brief rainfall had us temporarily worried the roads would be too muddy to make it, but when we got back 10 000 kgs of cherry had just been emptied into the collection tank and pulping had begun. Asafa estimated that it would take them 3 hours to empty the tank, so everyone should be going home just after midnight. One of the interesting things about this station is that they recycle their water, and being walked through the system in the dark I had a good chat with Asafa about the challenges and skills involved in milling coffee. The job is only there for 3 months of the year, the rest of the year he has to find other work. He said it was a tough 3 months, but also the best 3 months of the year for him. He’s been doing it for 30 years and reckons it takes 10 of them just to learn how to judge by eye, smell and feel the correct level of humidity at which to stop the parchment drying process. I believe him. 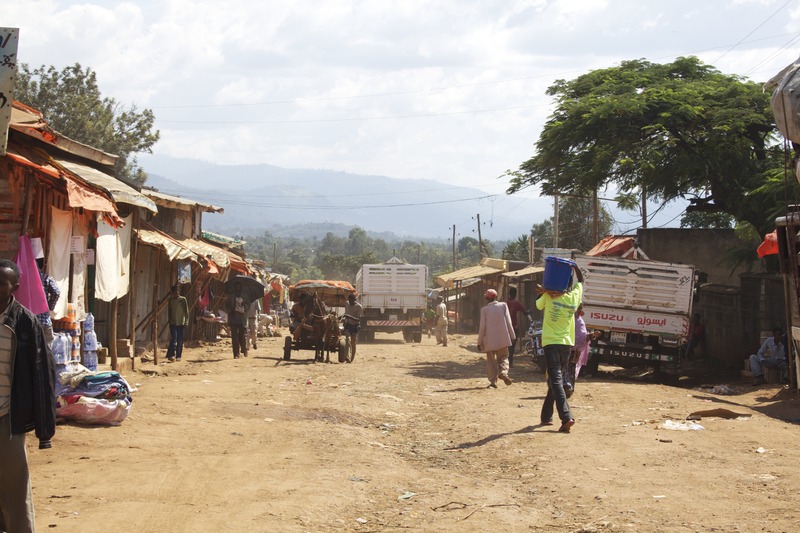 Low morning sun bathed houses and people in a warm glow as we set off to the ECX main office warehouse in Awasa. A 3 year old facility, due to the late harvest they’ve only been up and running for a week this season, and they’re still only grading and cupping the remaining sun drieds from the last crop. Yihenew Tsegaye the warehouse supervisor was on hand to show us around and patiently answered all questions, happy to explain some of the benefits of the new trading platform. One of the positives he pointed out was now that there are regional warehouses (Awasa, Dilla and Sodo in the south, and a total of 16 across the whole country) rather than just the Addis ones, suppliers have shorter distances to travel and therefore less expenses to deliver their coffee. Now they can make the drop off in a day or two, rather than spending perhaps 2 weeks on the roundtrip to Addis. 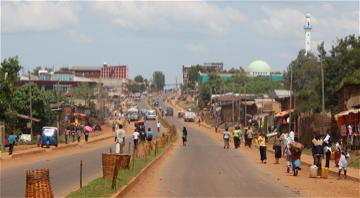 The Awasa office has a supply zone of a 250 km radius and deals with Sidama almost exclusively. 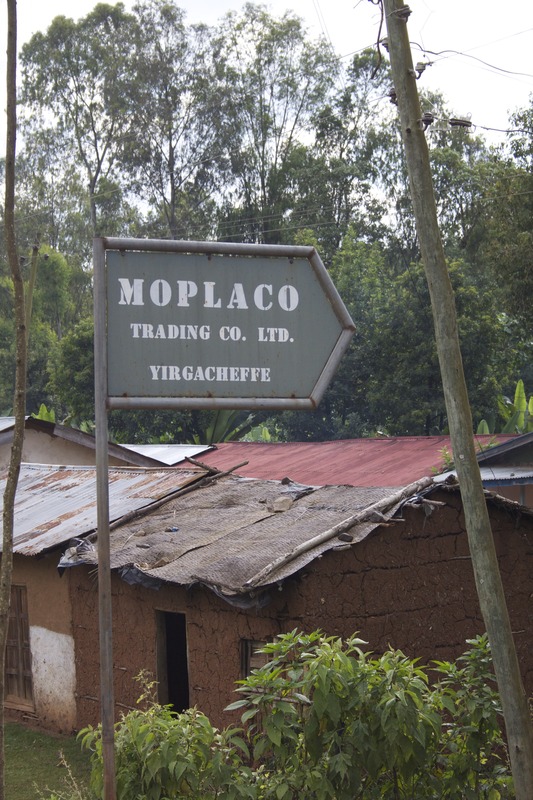 While the Dilla warehouse is only 90 km away they exclusively deal with Yirga Cheffe coffees. 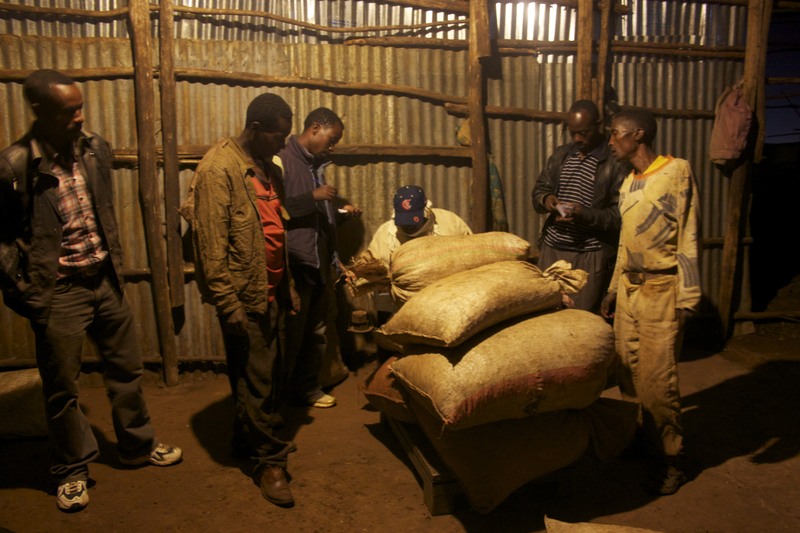 Awasa also occasionally get Harar D coffees from West Arsi. I didn’t know there was a Harar D, but this is apparently one of the Bali varietal. Chatting to Q graders Elsabeth, Frahiwet and Balkew who were were on hand to show us the process in the lab, we bonded over our love for the Sidamo Naturals we got to cup, but agreed that at this point in the year they were Q3’s at best. Yihenew walked us through the many steps in the process that happen at the warehouse, beginning with trucks arriving with bags from the akrabis. They arrive with a spec sheet of what’s on the truck – already controlled by the Ministry of Agriculture in Wareda who pre-sample the coffee that the akrabis plan to send to the EXC. The sheet details the coffee and the truck it’s coming in on, even down to the number of seals on the wires holding the tarpaulin covering the coffee in place. No tampering allowed here! When the truck pulls up all seals are checked and the middle row of 3 rows of bags on the truck is briefly unloaded so the sample collector can access all 30 bags. He’ll pull 100 g from each bag creating a lot sample of 3 kg. This is passed on to the coder, who number the lot and has the computer generate another random code for it, as well as pick at random the three Q graders from the staff who will cup and grade the lot. They get the sample with no knowledge of what it is or where it’s from, and proceed to homogenize it before checking the moisture level three times to get the average. 11.5 % or less is accepted, any higher and the akrabi will be advised to dry it a bit more before coming back. Then the sample is passed over the screen sizers, indicating the percentage of beans in the sample under the exportable size of 14. The defect count is performed according to the SCAA standards before the greens go to the sample roaster who takes it just past 1 crack giving a light roasted sample to taste. Once rested for 8-24 hours, the samples are cupped using 250 ml bowls with 13.75 g coffee in each bowl. Balkew took us through the ECX cupping sheets used to grade washed coffees and natural coffees. If in this first cupping a coffee scores well enough on their scale to be considered for a grade Q1 (100-91), Q2 (90-81) or Q3 (80-71) it will be re-cupped after 8 hours using adapted SCAA sheets, to double check that the coffees awarded the Specialty status of Q1 and Q2 really are up to scratch. Sometimes the samples can cup worse and be downgraded which could of course frustrating for the akrabis, like Mr. Dakola and Emnete who I spoke to yesterday. Based on the grading and cupping, a slip is filled in with the final results, one copy of which the akrabi receives. This feedback loop allows for a conversation about what can be done to improve the results for future lots. 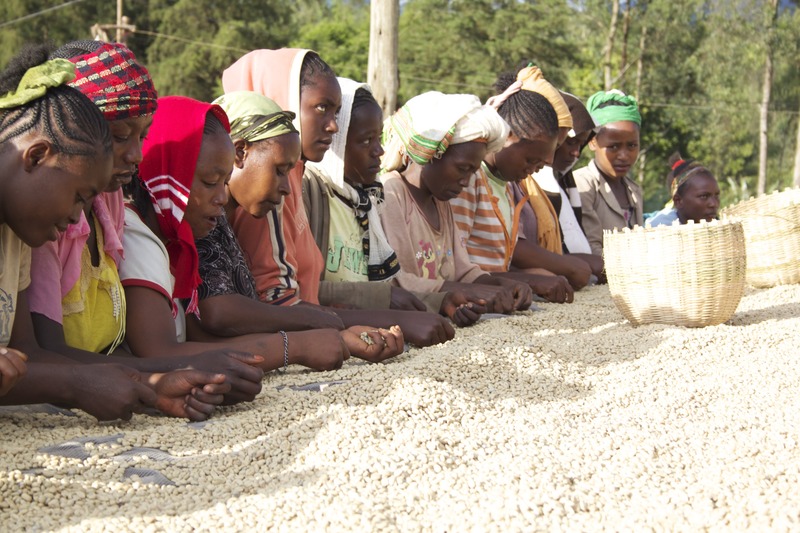 Whether the coffee rates specialty or commodity, this slip is also the only thing the exporters have to base their purchase at the ECX on, as they do not get to cup the samples themselves. Understandably this can be frustrating, but the ECX’s stance is that their Q graders are fully qualified to give an accurate written portrayal of the coffee, removing the need for further cupping by potential buyers. The next step is for the slip to pass back to the coder who produces a Coffee Quality Result Sheet linking the results with the correct truck, and the supplier has to sign off on the grading of his coffee. The lot is then weighed twice on different trucks to confirm total weight, and a sheet of Goods Receiving Notes is made which both the supplier and the warehouses sign off on. All info is then sent back to Yinehew in the main office for approval and forwarding to the auction house in Addis. There, the lot will usually be sold within a couple of days, but if it doesn’t the akrabis can keep their coffee in the warehouses for up to a month before they have to start paying rental fees on the storage space. Exporters who wish to buy have to deposit a lump sum of money into the EXC accounts before they can bid, so that upon sale confirmed the money can immediately be wired to the akrabis. It can now take only 3-4 days from the time they drop off their coffee till it’s sold and they have their payment in the bank. 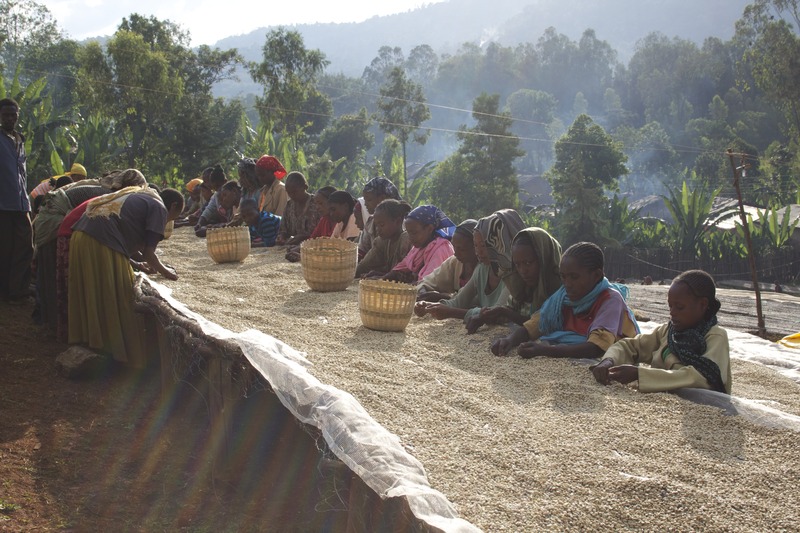 Within 10 days of purchase the coffee then has to be collected by the exporters, who now are the ones footing the bill for shipping the coffee to their facilities from the EXC warehouses around Ethiopia. With a truck and purchase notice form Addis in hand they go to collect from places like Awasa, who within a 1km radius have 8 warehoused capable of storing 25 000 bags each. While a system with many good sides, one of the criticisms of the EXC is that it’s not a system that benefits international buyers who wish to deal in specialty instead of commodity coffee, and are unable to go outside the ECX direct to a co-op. While the warehouses obviously can accurately trace all their coffees back to a truck and a washing station, this info is not passed on through the system. 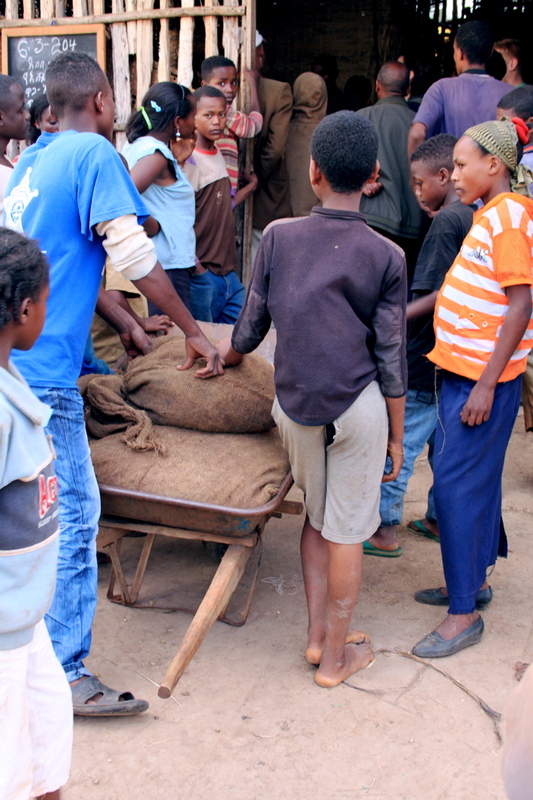 For example, the exporters will only be told that a coffee is a Sidamo A or Sidamo B, indicating a vague western or eastern location within Sidamo, but a Sidamo B could in fact be traced back to one of its quite specific administrative areas like Amaro, Aleta Wondo or Dara. But as specialty is such a small part of the total coffee export, the ECX have decided, at least at this stage, not to accommodate the communication of this intel. 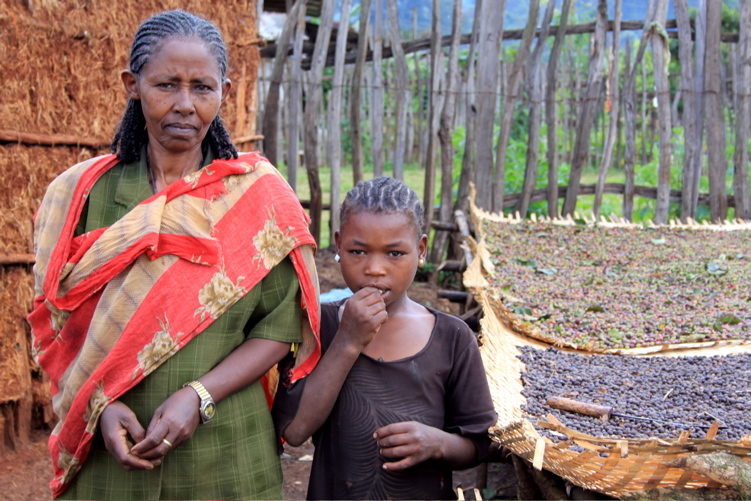 I hope it will change one day, or that we find some other way of encouraging and celebrating the uniqueness of the coffees from small villages in Ethiopia, even if they are traded on the Exchange. Tomorrow, I’ll hopefully go to see just how that trading works, since I’m obviously back in Addis now and able to post this ridiculously long post!